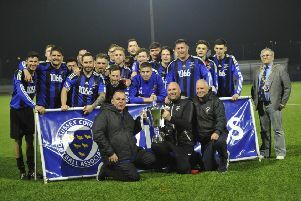 Manager Tobi Hutchinson was full of praise for Steyning Town officials and the emergency services after Eastbourne United’s Matthew Simpson fractured his skull in a Sussex Senior Cup tie on Tuesday evening. Simpson, 20, was playing his fourth consecutive game at fullback for United after recently signing from Ringmer. Ten minutes before half time, he clashed heads with an opposition player whilst challenging for a header. Both players fell to the ground and the game was delayed for more than ten minutes whilst treatment was delivered. Simpson was imediately substituted but collapsed during half time before he made it to the dressing room. Matt was rushed to Brighton Hospital and a scan revealed he had fractured his skull. A statement on United’s official twitter page delivered some news of encouragement by announcing that fortunately, there is no displacement of any bone, so the fracture should heal completely by itself with no long-term effects. Hutchinson had been impressed with the progress Simpson had made in his first few games after he immediately secured a regular place in the starting XI. “He fitted the bill perfectly for us in terms of a young, Eastbourne based, technically sound footballer. “He had been doing very well for us and had stamped his authority on the starting right-back position. “We wish him well. He’ll play a big part for us once he’s healed and he’ll be a good player for us for a long time. I think it will be two or three weeks until he can do non-contact light training. But we are expecting six to 10 weeks in terms of the actual fracture to heal. Eastbourne United official statement: “After a period on the floor, Matt was immediately substituted and left the pitch under his own steam. “As the teams were returning to the dressing rooms at half time, Matt collapsed and an ambulance was immediately called. “Two rapid response units and one paramedic unit were quickly on the scene, with Matt being assessed before being taken to Brighton Hospital. Following a scan, it was discovered that Matt had suffered a fractured skull. “Fortunately, there is no displacement of any bone at all, so the fracture should heal completely by itself with no long term effects. Our best wishes go to Matt at this time and we hope he has a speedy recovery.